Now that Autumn is here and the temperatures are cooling and the holidays are coming in close, there is nothing that trumpets the start of the cozy Fall season more than baking homemade bread. 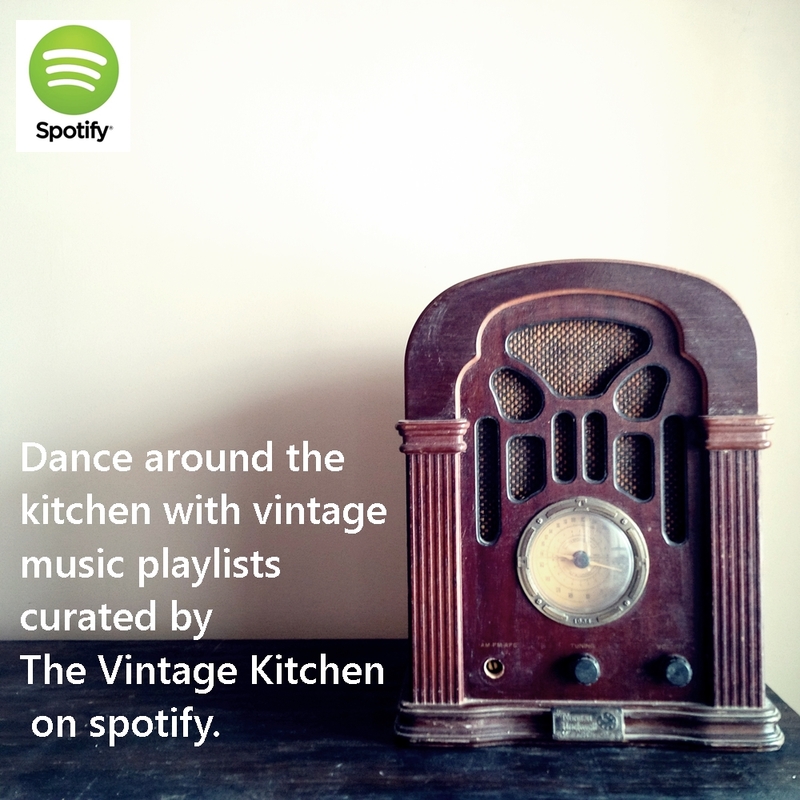 This week in the vintage kitchen we are exploring three different types of bread – one quick bread, one muffin recipe and one sandwich bread, all tackled the old-fashioned way. Meaning without a bread machine or any fancy paddling mixers. 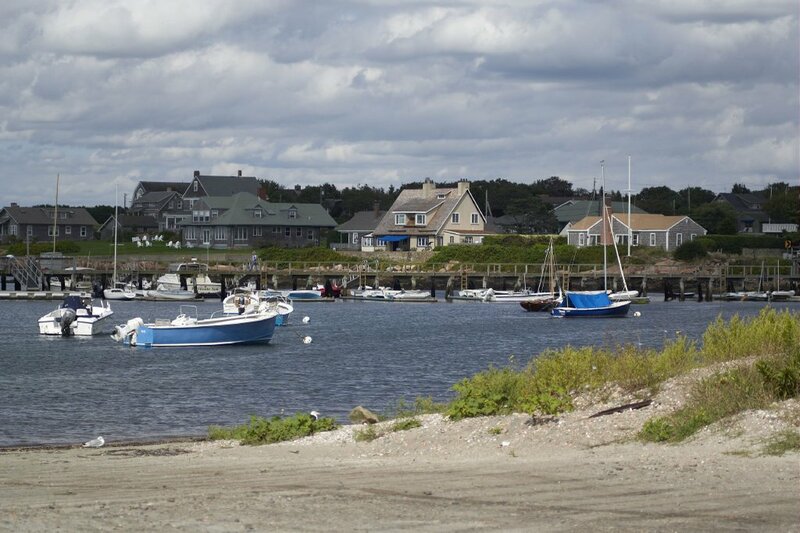 in the picturesque seaside town of Little Compton, Rhode Island. Tasked with writing a reigional cookbook made up wholly of New England fare, June compiled a list of over 250 recipes that represented the belly and bounty of diverse Northern appetites. 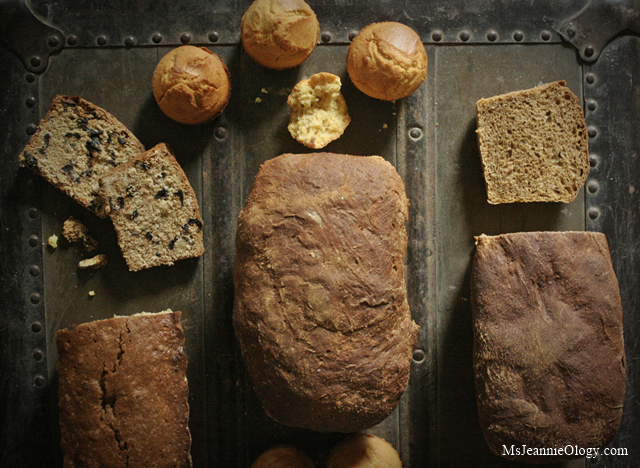 If you are anything like Ms. Jeannie, you find sandwich bread making a bit of a challenge. Usually when Ms. Jeannie attempts such creations her bread comes out weighing 18 pounds and has both the texture and composition of packed clay. Right when the oven door opens and the weighty wonder gets hoisted onto the cooling rack, she knows instantly that she’ll need not a bread knife but a handsaw to cut into such a terrible beauty of an endeavor. But things have changed dear readers. Ms. Jeannie can no longer say that baking is dreadful and that light, fluffy sandwich bread eludes her. Thanks to June Platt she has found her perfect sandwich bread. Easy to make, simple to bake. Success at last! Although it is is yeast bread and therefore takes some hours to fully prepare from start to slice, it is WELL worth it and very simple. You’ll never want to eat any other bread again. Stir cornmeal very slowly into boiling water, using a wooden spoon. When thoroughly mixed add the butter, molasses and salt. Try to work out any lumps by flattening them out with the back of the wooden spoon against the side of the bowl or pan. Add the yeast dissolved in the warm water. Add the flour, one cup at a time, stirring with the wooden spoon, to make smooth dough. Place on a lightly floured board or canvas and knead well. Place dough in a well-buttered bowl and cover with a cloth wrung out in hot water. Allow to rise in a warm place, free from drafts, until more than double its original bulk (or for about 2.5 hours). Preheat oven to 400 degrees , and butter two 9″inch bread pans. Turn the dough out onto a lightly floured board again, knead lightly and shape into two loaves. Place dough in the buttered pans , cover with a towel wrung out in hot water , and allow to rise again until doubled in bulk (about one hour). Place the loaves in the pre-heated oven and bake until they are a deep golden brown (about 45-50 minutes). Place on a wire rake to cool before removing loaves from pans. This a fun recipe to work on while you have a whole home day planned. Because it does take some time you may want to double up on the recipe and make four loaves of bread so you can stick some in the freezer for later use. *Ms. Jeannie followed this recipe and the steps exactly with the exception of the flour. She used 2 cups all purpose flour and two cups of cake flour which is little bit lighter in texture. This combo may have aided in a slightly fluffier loaf. Moist, flavorful, easily sliced (no handsaw required!) this sandwich bread is perfect for everyday use in the versatile sandwich department. Hopefully it will become a household staple in your kitchen, like it now is in the land of Ms. Jeannie. Another batch of bread was made this time using all-purpose flour (in place of cake flour) and olive oil (in place of butter) and it came out equally as wonderful and delicious. The all-purpose flour makes it the tiniest tiny bit more dense but other than that there are no noticeable differences in either taste or texture, which leads Ms. Jeannie to believe that this just might be the most versatile and easily experimental bread recipe ever. Next time, she’ll try it with a sprinkling of nuts, seeds and/or whole grains to see what happens. Stay tuned on that front or experiment yourself and let Ms. Jeannie know how it all turned out in the comments section below. 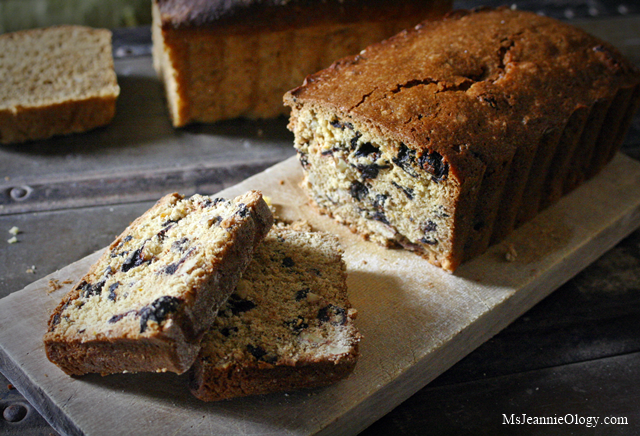 Fruit and nut breads are always an instant favorite and an easy go-to for busy morning breakfasts. Ms. Jeannie never passes on homemade banana or berry breads and likes to experiment herself with different flavor combos when it comes to quick breads. Since we are in the middle of nut season, June Platt’s vintage recipe for Cranberry-Orange-Walnut Bread sounded wonderfully delicious and in-season. Only there was one slight problem. Cranberries. Ms. Jeannie scoured high and low, store to market to store again. There were no cranberries to be had anywhere in her fair city, fresh frozen or otherwise. A bit too early for Thanksgiving relish season, perhaps, New Englanders must have made this bread in the colder mornings of November instead of October. Out of season, but not out of spirit Ms. Jeannie substituted. And then substituted again. Dried sour cherries replaced fresh cranberries and almonds replaced walnuts. Cherries seemed fitting on the historic side – George Washington was a fan after all. On the flavor side they are sweet yet tart like a cranberry and the dried version seemed like the next best thing. Just be sure when preparing this recipe you look for pitted sour cherries. Ms. Jeannie found her cherries at the international market inside her local farmers market and they were not pitted. That added a sticky extra 30 minutes in the prep department. Preheat the oven to 350 degrees. Butter a 9″ inch bread pan. Combine the flour, baking powder, salt and baking soda. In a separate bowl, combine the beaten egg, orange juice, grated rind, water and sugar. Add the sifted ingredients and stir just long enough to mix. Stir in the melted butter. Fold in the sour cherries and almonds. Spoon mixture into the loaf pan and bake for 1 hour (or until inserted toothpick comes out clean). Oven temperatures really vary the timing on this one so keep your eye on it. 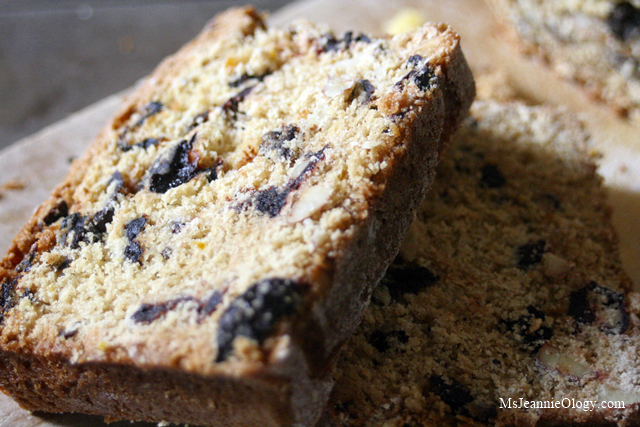 Because the almonds add a little hearty protein and the cherries mingle tartly with the sweet orange and cane sugars this bread is almost like a soft protein bar. Two slices are very satisfying especially when served warm with a little butter. A lovely alternative to oatmeal on those frosty winter mornings and a great bread for holiday house guests with its fast, festive and easy to freeze attitude, this bread will make holiday entertaining a breeze in the brunch/breakfast department. Our final bread comes to us by way of Vermont. June Platt had a special soft spot for the state and especially loved the maple syrup that sweetened all matter of meals in Fall and Winter. Her recipe for Vermont Johnnycake Muffins is ideally suited as a companion for a warm bowl of chili with its dense composition and hint of maple sweetness. 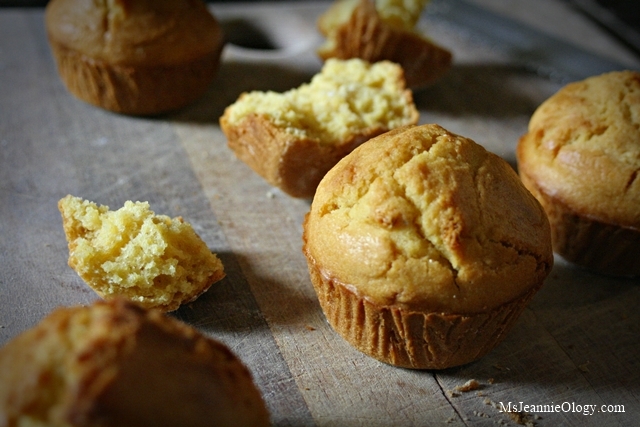 Essentially it is a cornbread muffin with a cute name. But as Ms. Jeannie knows living in the South there are two VERY different camps on the subject of cornbread. 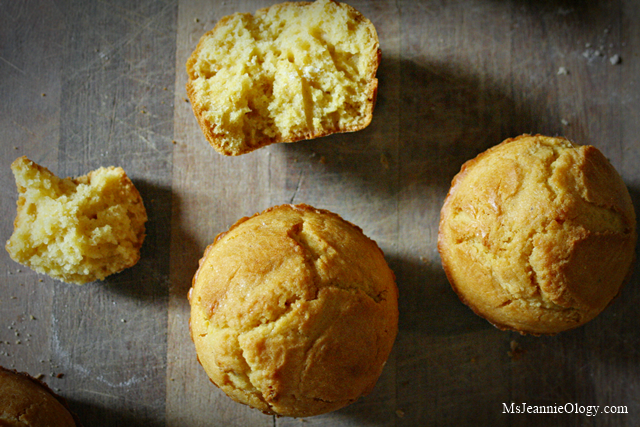 Northerners like their cornbread sweet, Southerners like their cornbread sour (or non-sweetened if you will). Ms. Jeannie prefers hers a a little on the sweet side but not so sugary that it tastes like cake. This Johnnycake is a hospitable meet-you-in-the-middle between North and South. A cornbread for everyone. Sift the flour, baking powder and salt together , add the cornmeal and sift again. Combine the remaining ingredients and add to the dry ingredients, stirring only enough to dampen all the flour. Pour into well-buttered muffin tins and bake in a hot oven for about 30 minutes or until golden brown. June suggests serving these handsome guys with Maple cream or Maple Butter. Ms. Jeannie suggests a little bit of jalapeno jelly, a dollop of goat cheese and a drizzle of honey. Like the other breads above, these muffins freeze well and can fill up a hearty appetite in a half second. Its just the kind of fortitude you need when shoveling snow or battling that freezing wind rolling in off the coast. Released to great critical acclaim, all the recipes in this cook book re-introduced regional delights that were overlooked and underrated in mid-20th century America. June helped bring them out of hiding 45 years ago and in turn four decades later, Ms. Jeannie is shining a spotlight on them again today. So whether you are looking for something new to bake-up this season or you are like Ms. Jeannie just trying to bolster up your bread baking abilities look no further than New England dear readers! 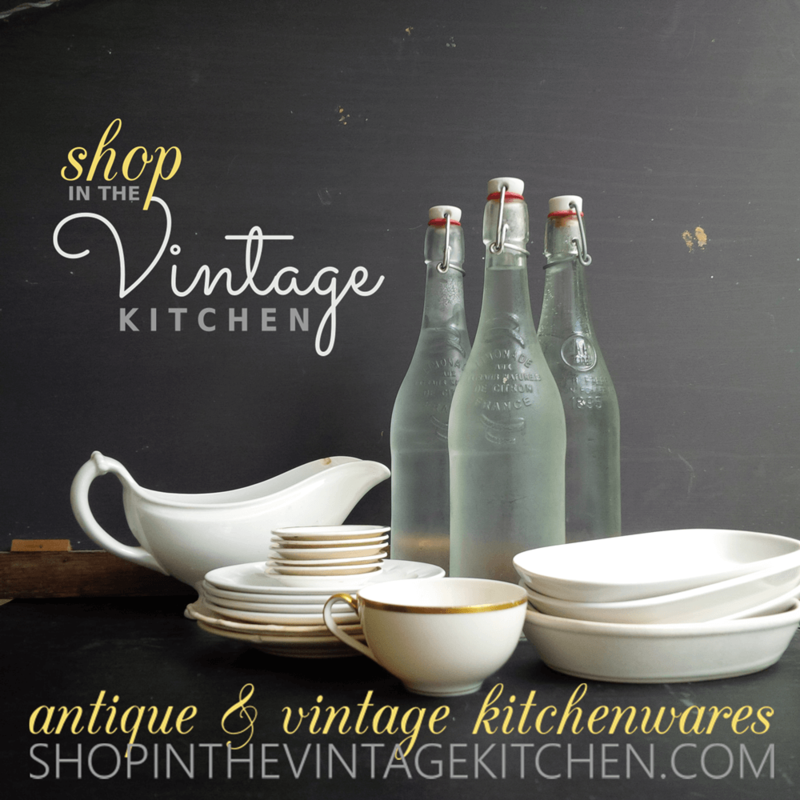 To explore more vintage recipes from June Platt’s New England cookbook, including the wonderfully named Beach-Plum Jelly, Rinktum Ditty, Cranberry Troll Cream, Red Flannel Hash and the classics- Lobster Rolls, New England Clam Chowder, Boston Baked Beans, etc etc etc… visit this link here. Cheers and happy baking from June, Jeannie and all of New England!